I used to garden in a place with real winters. The ground froze and the garden was sealed under a foot or more of snow for several months. It was closed for the season. There was no question of any garden work during those months. The only thing to do was look at seed and plant catalogues and dream. Here, winter is just a pause, not a shutdown. Today it’s 10 C (50 F). The only snow is on distant mountain peaks and the grass is green and wet. Everything is wet, and in fact there’s about as much garden work to do as in the frozen, snow-covered situation. I can’t even mow the grass, never mind dig or edge. Pruning may be done, but that’s about all. And starting seeds in the house, of course, but that’s not really a garden job, since it’s done inside. But things are blooming — in January, one of the longest, coldest, darkest months of the year. 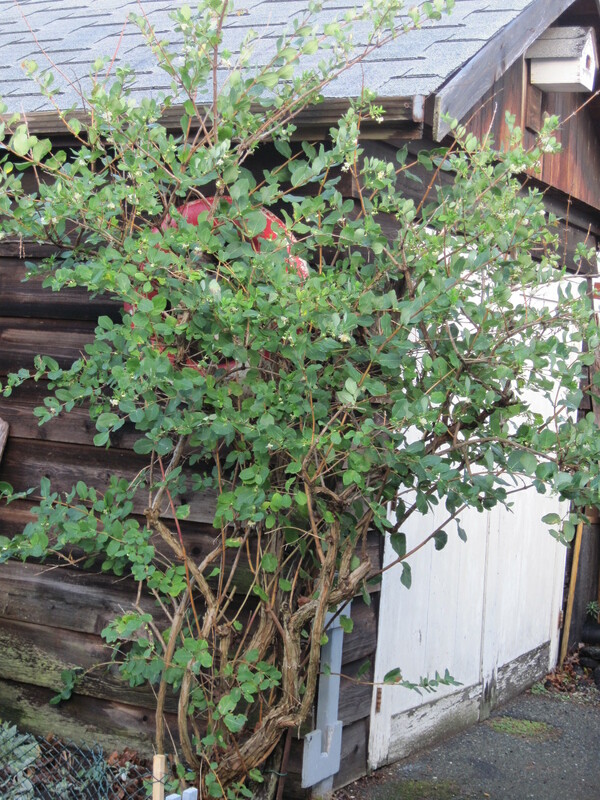 When I moved back to the coast more than twenty years ago I couldn’t wait to install shrubs and other plants that would bloom in January. 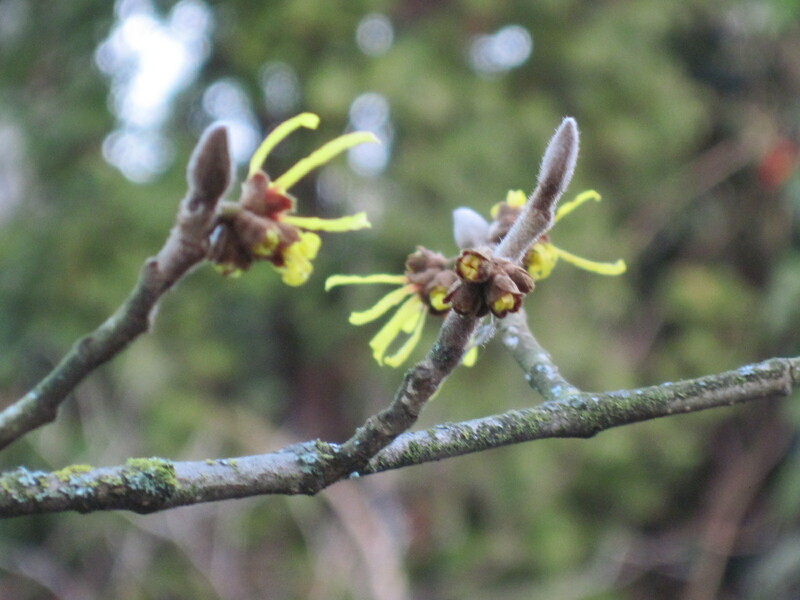 First among them was a Chinese witch hazel (Hamamelis mollis). Unfortunately, the plant I ended up with, and possibly its location (in dry sandy soil, shaded by maples and an ailanthus much of the summer when the buds would be forming) has resulted in almost no bloom. Very disappointing. There have been only three years out of those twenty when it has produced any flowers at all. This is one of those years, why I’m not sure, because the conditions under which the plant is growing haven’t changed. Maybe last summer was perfect in some way. In any case, the little tree is in full bloom right now — not spectacularly, compared to better plants in happier situations, but better than no bloom at all. The individual flowers are just thready wisps of yellow; you have to see hundreds of them at once to get the full effect, and they don’t photograph well when there are relatively few, so you’ll just have to use your imagination. There is a nice fragrance too, when there are enough flowers. The winter honeysuckle (Lonicera fragrantissima) is also blooming well. 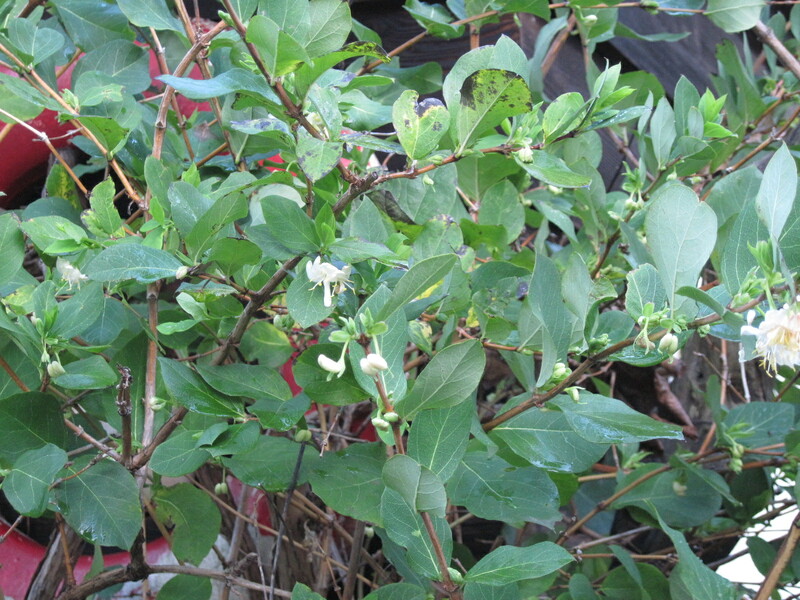 It’s a semi-evergreen shrub that shoots out new branches all summer long. They quite often die inexplicably, so a good deal of pruning is needed to keep the plant looking tidy. 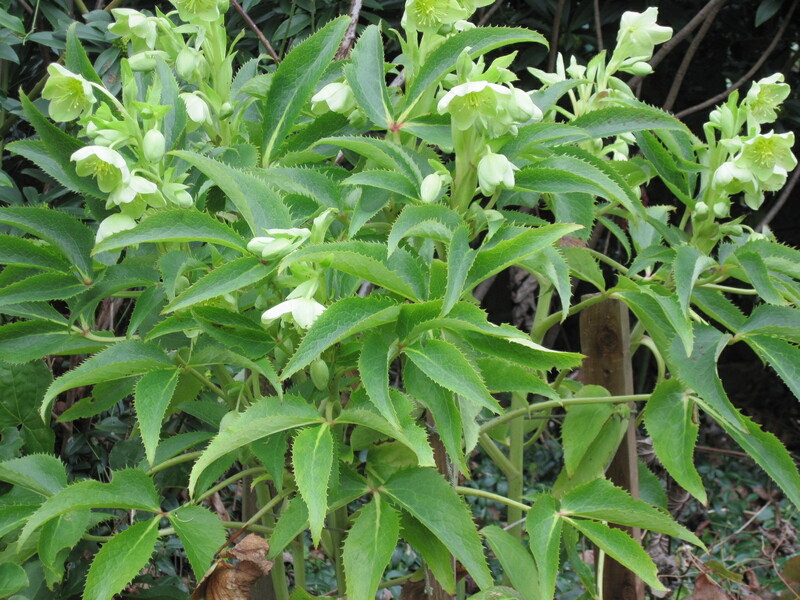 The flowers are by no means showy, but the fragrance, especially in the evening, is something special — a lemony sweetness. 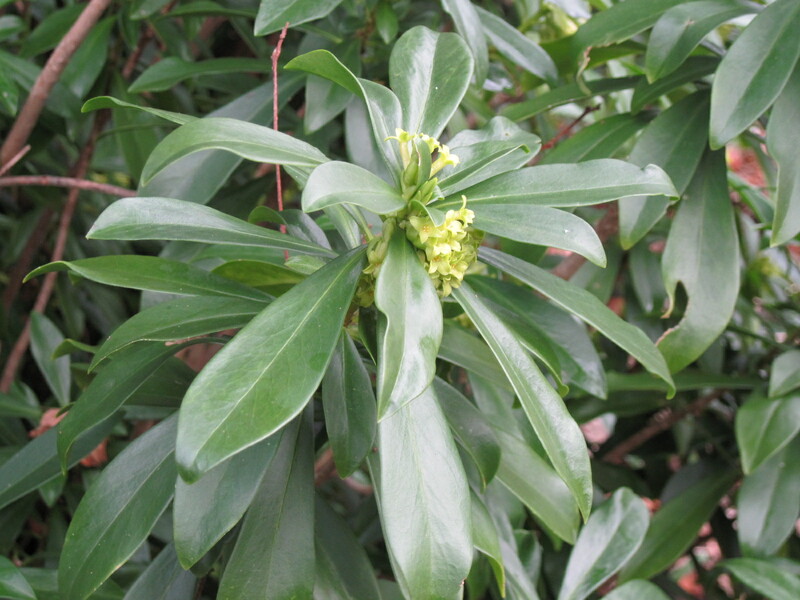 Another January-blooming plant that sends out an alluring fragrance at night is really a weed — the spurge laurel, Daphne laureola. It’s a tough, drought-tolerant shrub that self-seeds generously, so has become an invasive pest in woodlands here. I have a few of them around the edges of the garden, and as long as I pull up the dozens of seedlings they produce, I can enjoy the haunting perfume on damp winter evenings. 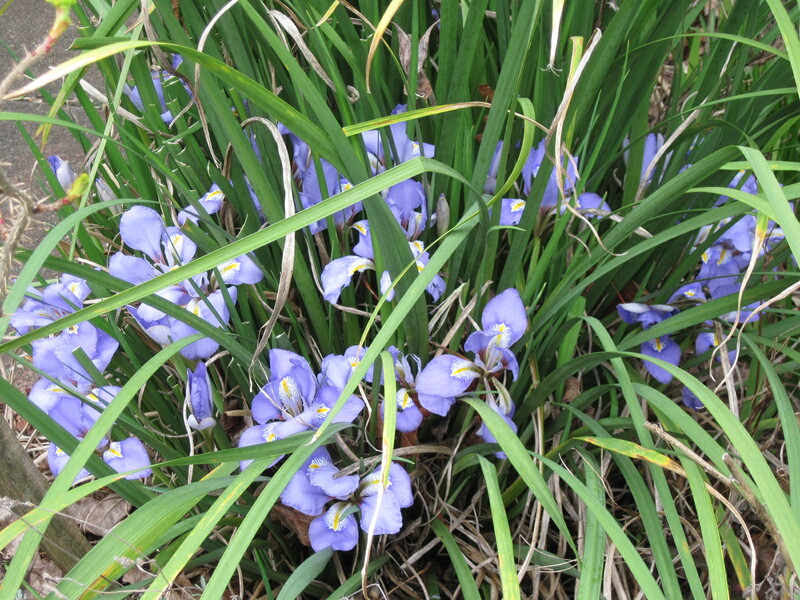 Then there’s the Algerian iris (I. unguicularis). The foliage is messy, but the flowers are improbably gorgeous in January. The Corsican hellebores are among the winter-blooming stalwarts in this garden, totally reliable, as are snowdrops. 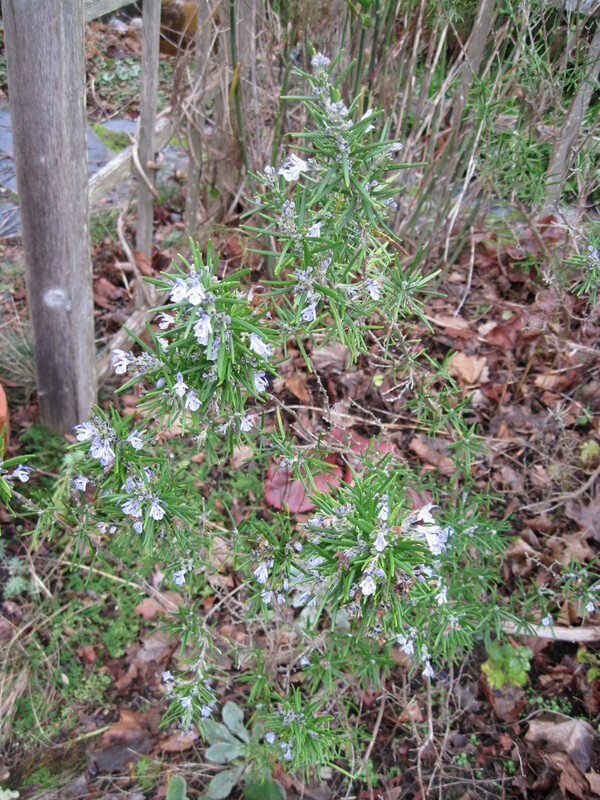 My scraggly rosemary plant, which has put up with shade for twenty years of summers, blooms defiantly in January. I guess the absence of leaves on the maples in autumn enables it to set buds. The flowers are little pale blue things that would go unnoticed in summer. 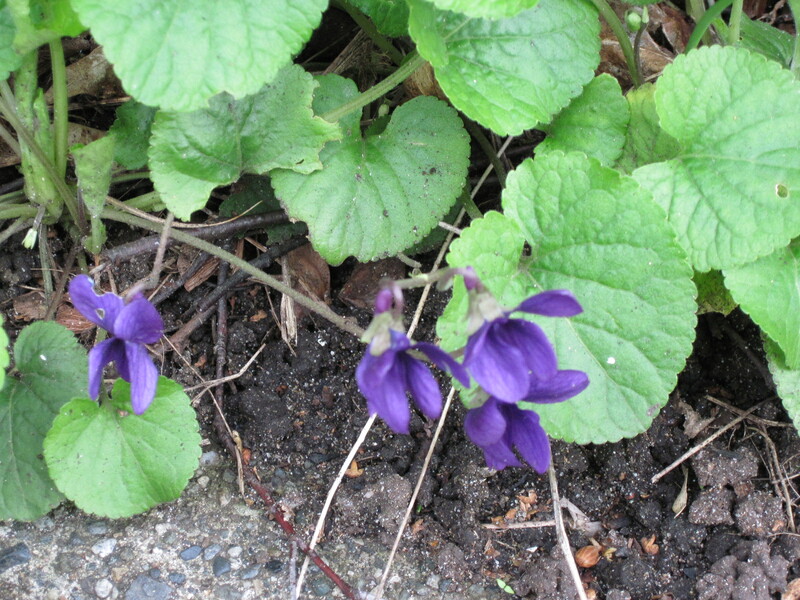 And finally, another weedy plant with fragrant flowers — the modest violet. The perfume sneaks up and delivers a pleasant surprise when I’m standing around contemplating the garden on a January day. 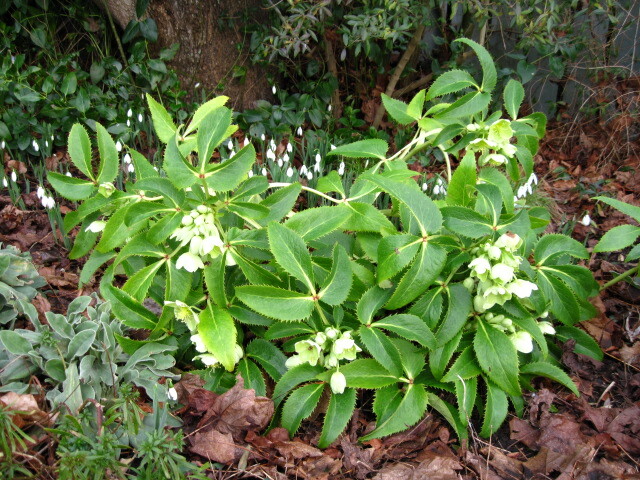 Witch hazel, Winter honeysuckle, Spurge laurel, Hellebore, Snowdrops, Rosemary, Violets, Yellow crocuses, Iris unguicularis.